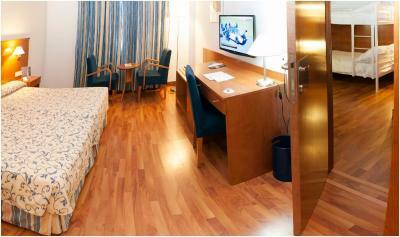 Lock in a great price for Extremadura Hotel – rated 8.5 by recent guests! Nice comfortable room. 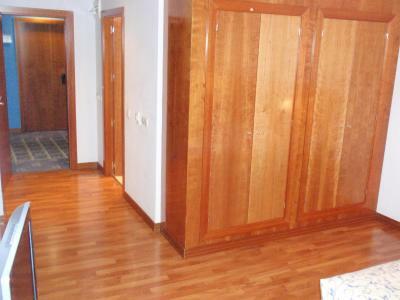 Walking distance to Old Town of Cáceres. Good breakfast options. Comfortable and clean room. 15 minute walk to centre of town and beautiful old square. 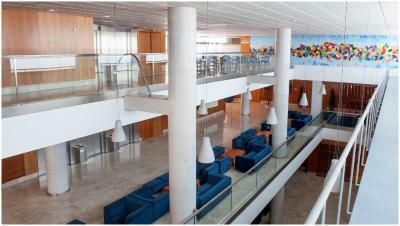 This is really a large and shiny conference hotel, not a sightseeing or touring hotel. 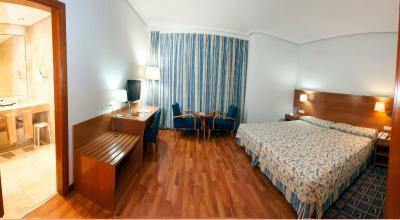 But they offered good value and we were very happy to stretch out and relax in the spacious rooms of the Extremadura hotel. It was a five minute taxi ride to the old town, all good. 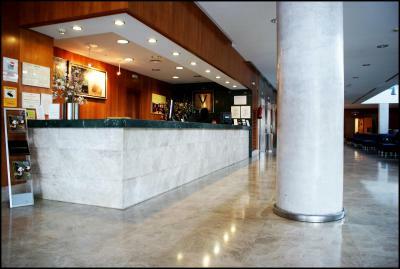 The staff were accommodating and friendly taking into account our lack of Spanish language skills. The room was large with plenty of room. Underground garage with multiple lifts to all floors. The breakfast was unbelievably good and an excellent way to start the day. Friendly and helpful staff; really good restaurant on site. 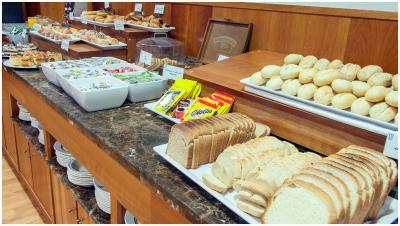 Good location, friendly staff and great breakfast! Only a short 10 min walk to Plaza Mayor and all the sites. The staff were helpful at recommending restaurants for vegetarians and the breakfast was great with something for everyone. 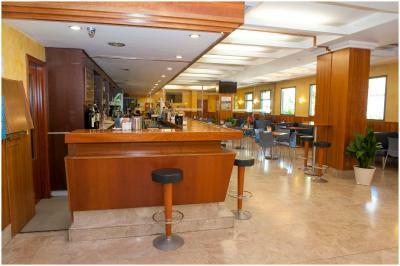 Convenient location located in city center yet not far from the highway exit. Easy to find. Comfortable spacious room. Good breakfast. 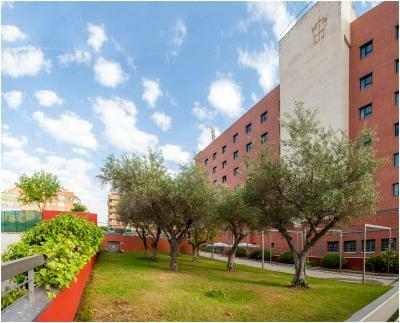 Extremadura Hotel This rating is a reflection of how the property compares to the industry standard when it comes to price, facilities and services available. It's based on a self-evaluation by the property. Use this rating to help choose your stay! 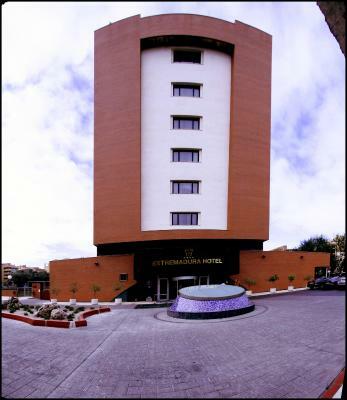 One of our top picks in Cáceres.Each of the rooms at the Hotel Extremadura have a modern design and free WiFi. 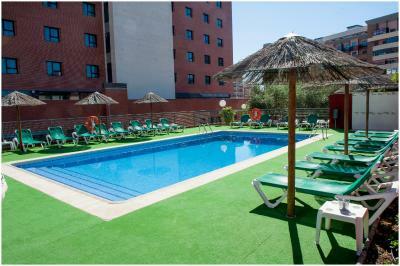 It features a seasonal outdoor swimming pool, and is located in the heart of Cáceres and next to Principe Park. Full heating and air conditioning, satellite TV and a work desk can be found in rooms at Hotel Extremadura . 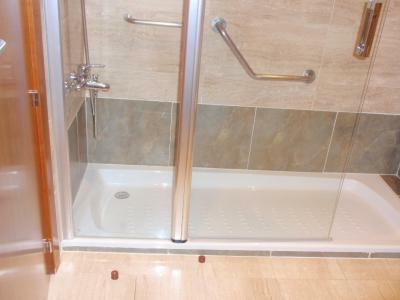 All come with a large, private bathroom with a bath. 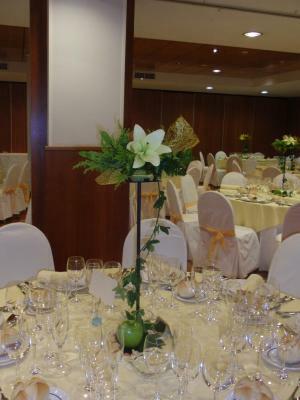 The on-site restaurant, Orellana, serves local cuisine and homemade desserts. 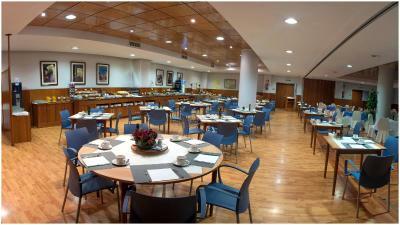 The hotel also has a cafeteria and a breakfast room. 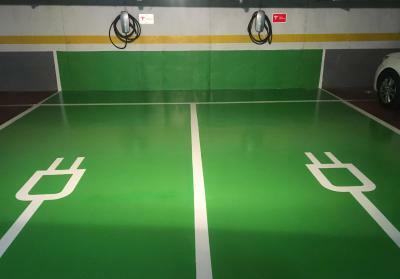 Other services facilities available include an electric vehicle charging station. 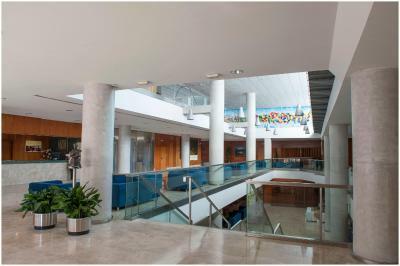 The historic center of Cáceres is within 15 minutes' walk of the Hotel Extremadura. 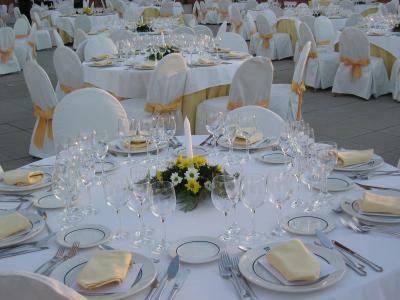 Guests can also visit the nearby town of Trujillo. 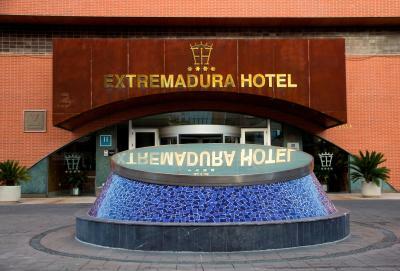 When would you like to stay at Extremadura Hotel? These exterior-facing rooms feature 1 king-size bed or 2 single beds and include a marble bathroom. Free WiFi is available. 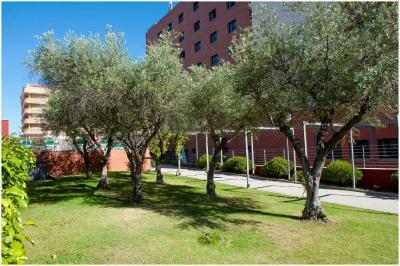 Private parking is available on site (reservation is not needed) and costs EUR 14 per day. 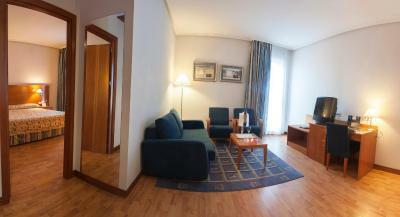 This suite features 1 king-size bedroom and a separate living room with sofa bed. The bathroom with marble finishing has a hydromassage bath tub. Free WiFi is available. These exterior-facing rooms feature 1 king-size bed and an extra single bed, or 3 single beds. It includes a private marble bathroom. Free WiFi is available. These exterior-facing rooms feature 1 king-size bed and an extra single bed, or 3 single beds. 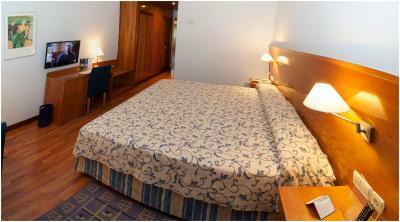 It accommodates 2 adults and 1 child up to 11 years old. It includes a private marble bathroom. Free WiFi is available. 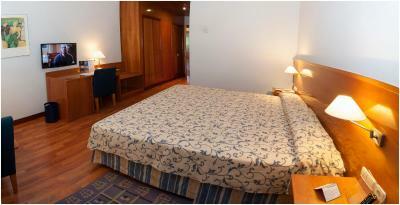 This air-conditioned room includes satellite TV, a mini-bar, safe and a private bathroom. Free WiFi is available. This room features free WiFi. 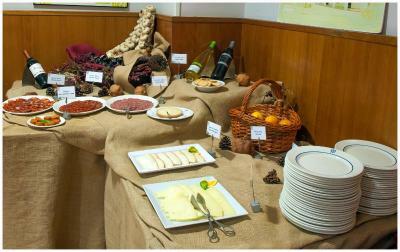 House Rules Extremadura Hotel takes special requests – add in the next step! 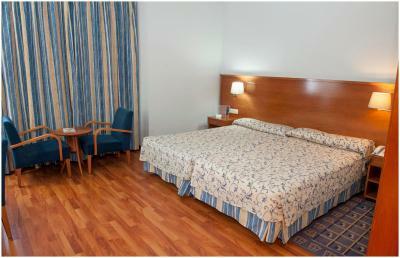 Any additional older children or adults are charged EUR 29 per night for extra beds. 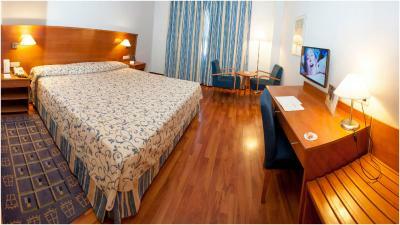 Extremadura Hotel accepts these cards and reserves the right to temporarily hold an amount prior to arrival. Please note the outdoor summer swimming pool is open from June until September, weather permitting. Old rooms (not retro, neither historic; just old); brown water came out the pipes, had to let them run for a while to get it somewhat clear. No slippers in the room. This place might have been great in the 80s, but it remained there... Not worth four stars, or the price. I would not go back if again in Caceres. The fact that we didn't realise that the carparking was an extra and that the quoted rate had gone up between the booking and our stay. It would be better if it was quoted \s an extra lke the Breakfast. Camas super incómodas, imposible descansar. Parking muy caro, no merece la pena. Room was a bit outdated although nice and spacious. Although the price for a room was great, the parking charge was pretty outrageous! Underground Parking was too expensive. 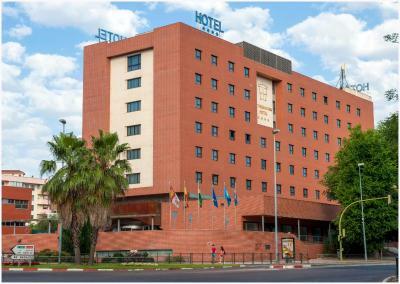 €12.90 for one night is not reasonable. Tidy, comfortable room, very good breakfast. Hotel is near centre, no problem to walk the small distance. Parking is very easy as there is space even for bigger cars. 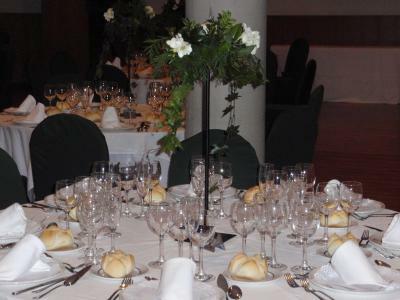 It was a lovely room and had parking on the grounds. Would like to have had tea/coffee making facilities. Comfy bed. Nice and quiet.